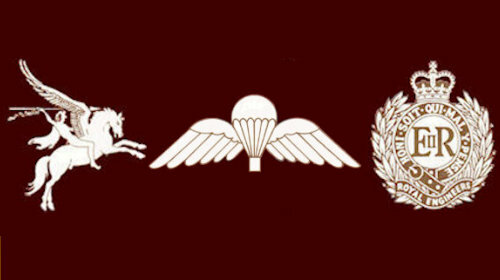 The 299 Association continues to thrive and the numbers tend to increase on a monthly basis, mainly with men from our Commando past, the young para lads currently serving with the squadron are generally not interested in associa­tions just yet, but their time will come with age, providing the squadron can survive the current situation of training young men for an airborne role, only to deny them parachute training, this is hopeless for retention & recruitment, also not good for the defence of the realm. 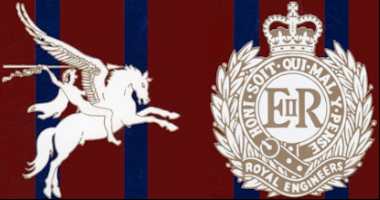 The year got off to a bad start with the loss of a couple of members, Dave (Dazzle) Skoyles, ex REME and Lyndsey Love ex 1st Battalion, both men had played a major role both in the Association & Squadron and will be sadly missed. A big bash took place down the 'Lonergan Lines in Kingsbury as 131 said goodbye to Major Olaf Dudley as he moves on with his military career, this man is owed so much by 131 and many men from this association wanted to make the trip to say good bye to 'Duds A presentation was made of boots with RE badge on an engraved plinth, saying "To Sven from the men of 299"
John Donaldson continued his drive to correct the unlawful injustice issued to the dead and wounded men of 300 Squadron during 1965 in the Radfan, with success coming in November this year, his campaign was fully supported by this association. A new brass plaque for the Toscaig Bridge (Scotland) was proposed and designed by Eamon Smyth this bridge was built by 299 Troop, 131 Commando RE during the 1990's and the plaque is being processed now at the royal Naval workshops. An appeal for help for a super wheel chair needed for Dave Bowron, a friend, and former AEA member from the Birmingham branch, the association was pleased to help with a generous donation. This year in Hull marked the 50th anniversary of the "Triple Trawler Tragedy" of 1968, this massive loss of life brought badly needed legislation for the safety at sea and the Remembrance Service was fully supported by this association. SSgt Carl Ham finished with the squadron in March after serving for many years, this very experienced soldier who had completed tours of active service will be greatly missed by 299 who saw fit to give him a presentation at this meeting. Tony Kitching organised and ran a very enjoyable clay shoot which raised enough to pay the wheel chair donation. The AGM in May witnessed the incumbent administration re-elected after failing to attract new blood, but fair warning was given by Martin Tindle (Treasurer), that, this will be his last year. Bernard (Bunny) Brown died this month a great loss to all, and a couple of weeks after his well-attended funeral the news broke with the sad loss of Keith Robinson, a real stalwart of 299. Keith's funeral attracted a big gathering of former and serving 131 men from far and wide. September brought our usual Arnhem Pilgrimage of 40 odd people, and despite the weather it went well. Unfortunately the Cromwell Lock Service of Remembrance fell on the Arnhem weekend, thus reducing the potential numbers attending. Another death announced this month of Dave Bowron who, like the rest of lads departing the village this year he fought long and hard, but to no avail, yet another well attended funeral. 299 Association paraded at the Yorkshire Air Museum Memorial Day thus marking the Centenary year for the RAF, also the Armistice, this was well received. October brought the AEA Gala Dinner/AGM weekend hosted this year by the Chatham Branch, this was poorly attended by 299, but by all accounts turned out to be a great success. Martin Tindle was awarded a Presidents Commendation for 15 years continuous service with 299 Association. In October, Richard Gill climbed Mont Blanc and was witnessed waving a 299 rugby shirt at the summit. 299 are fortunate in having many unsung heroes amongst its members, some of the examples range from people who answer when called upon by Hull's Civics to help the less fortunate people within some of the not very affluent parts of our community, on the 31st Oct (Halloween) over 3,500 children had a smile brought to their faces, mainly because of this associations efforts. We have people freely offering their standard bearing skills to the CESA (Combined Ex Serviceman's Association) allied with the RBL. There are volunteers helping in the Hull's People Museum down Whitefriargate in Hull, helping in bringing the City's past to all. One member who religiously goes to every past members known grave at this time of the year, placing a cross with poppy on behalf of us all. 299 looks after certain memorials when needed, cleaning, planting, weeding, etc. Whatever is needed, this is possible because of the good will and generosity of active members within this association and the world is a better place because of them. We extend sincere good wishes for the Festive Season and to one and each a Very Prosperous New Year. This last calendar year started with very bad news posted by Bud Oldfield on the 12/5/2017 with the death of Pete Nixon, ex 2 Troop, 299 Squadron, 131 Regiment RE, based in Doncaster. He served from the 50's — early 60's and saw active service in Suez, Cyprus and Aden. 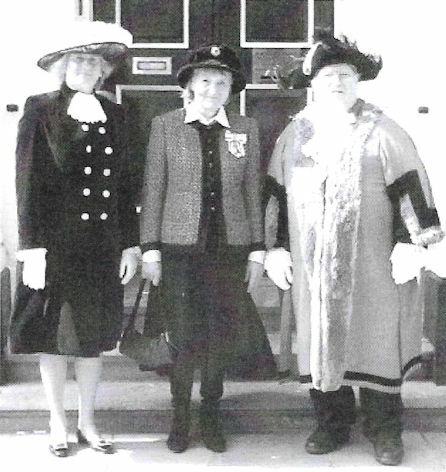 A very popular man always in the middle of things, he fitted a lot into his 83 yrs, and a good few men from this association helped in laying him to rest. John Lee AEA President launched his AEA car badge on the 25/5/2017, I believe there are still some available. A brilliant turnout from this association on May 28th 2017 with 23 members attending the Falklands/Norland Memorial service and wreath laying at the Corporation, (Victoria), Pier in Hull. General Julian Thompson, (ex CO of 3 Commando Brigade during the war), led the parade and mixed freely with all after the service. Commanding Officer 1 Troop 299 Para Sqn. Capt. J.C. Thompson tied the knot again this month, can't seem to rid himself of this addiction to wedding cake, we wish him well. A very enjoyable mini bus visit to The National Memorial Arboretum took place on 20/5/2017 to coincide with the Palestine Memorial day, ex 299 & 301 men joined the service with Standards along with the few remaining Palestine vets, including our own Tony Costello. A very moving service, also a chance to meet up again with Bunny Brown. Bri. Bilton picked up Les Ransom and Tony Irwin picked up Simbo on the 15th July for the Northern Airborne Forces Day at Eden camp, standards were paraded at the service, after, a good chance to catch up with Charlie McGolgan over a few beers. Johnny Mace brought the sad news that Fred Rands died peacefully at his home on August 2nd 2017, we knew he had not being well for a long time, Fred's family was taken-a-back by the association's attendance at his funeral, it was the least we could do for our favourite Corporal. Kev Saddington along with a group of ex 299 Commando's set out to walk the Monte Rosa Trail in Switzerland, started on the 1st Sept 2017 and took 7 days to complete, full kit and unsupported. Charitable donations went to McMillian Cancer Support. Great effort with new hips & old alike. Tony Kitching posted the sad news that ex 1 Para & 299 Sqn RE man Lyndsay Love has just recently passed away. Contact had been lost with him and unfortunately the news broke after his funeral. Good turn out by this association to the YORKSHIRE AIR MUSEUM for their Memorial Parade & Service on Sunday 3rd September 2017 a brilliant day that was very well received and our participation was greatly appreciated. Johnny Mace posted the sad news of another old 299er who has passed away in Australia, RIP Mally Scott served in 299 from mid-50's to early 60's, not much detail on this. 34 enjoyed the 299 Arnhem Pilgrimage of 2017, many first timers on this occasion. This association hosted the 2017 AGM & Gala Ball at the Britannia Royal Hotel in Hull on Saturday 21st October 2017, and by all accounts it was well received. Brilliant job by our team headed by Mal C. Wilcock. We did our usual bit for Councillor Anita Harrison in her quest to help the under privileged children from the Brandsholme estate in Hull. Halloween experience & Santa's Grotto, I'm sure we will be asked again this year. Paul Hairsine (Hairy) had a heart attack doing all the right things! He's now, thankfully up & running again. 299 Standard was paraded at the Hull Cenotaph on the 11th of the 11th with a good representation from this association. Great turnout for Remembrance Sunday (42), good to have the Squadron with us in Hull, buffet kindly provided by Weldo & Sqn. Two presentations given out on this occasion 'Weldo & Woody' (Posthumously). A Squadron & Association representation with standard was asked to attend a short service of Remembrance at the 'To the Fallen' memorial on the Brandsholme Estate in Hull. Capt. 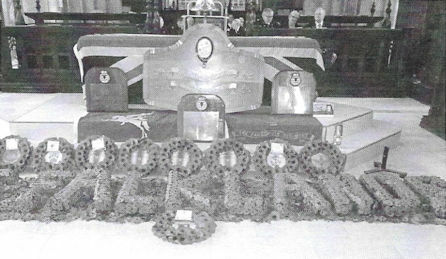 J. C. Thompson laid for the Sqn. More bad news from Birmingham this time, the death of Roy Hicks 131 cook for many years, a car full of 299 men made it to his Funeral. The 'Brummies' did him proud. The death of Dave Skoyles on 29/12/2017 shocked us all, a sad loss to this association, big turnout for his Funeral. A much respected Associate member and friend. Major Olaf Dudley moved on from 131 after many years of service, big leaving do at the Lonergan Lines in Kingsbury, 299 men attended with a presentation and the Squadron's good wishes. Throughout the year John Donaldson, (Scotland), never let go of the struggle for the GSM (South Arabia clasp), on behalf of the men who fought and died in the Dahla Road action of Aden 1965. Members from this association attended the 50th Anniversary Memorial service for the Hull Triple Trawler disaster of 1968 at the Hull Minster. This disaster changed the 'Safety at Sea Laws' for the better. Bud Pougher reached 80 yrs and association men helped him enjoy it. Presentation at the March meeting for S/Sgt C. Ham, 299 Squadron honoured this special man for his many years of valued service given. Tony Kitching pulled off a great day's clay pigeon shooting, a real association family affair, including a brilliant buffet at the Bay Horse in Cherry Burton, also made a profit for charity, well done Kitch. 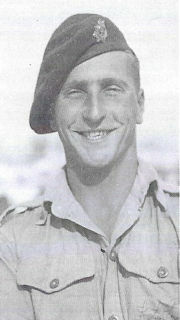 Les Ransom reached his 96 yr on April 5th there's no stopping this Arnhem vet. Members from this association attended the Annual Remembrance Service & Parade at the Hull Minister on Sunday 29th April 2018 for the MV NORLAND & SAMA 82. 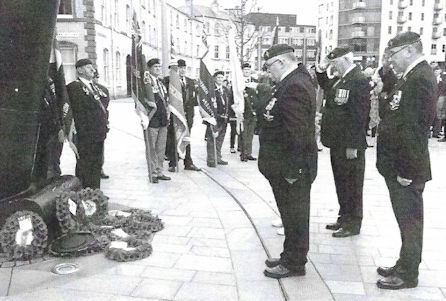 Wreaths were laid at the permanent Norland memorial in Hull. The Hon Mrs E Susan Cunliffe-Lister, HM Lord Lieutenant of the East Riding of Yorkshire, Sukey Cameron MBE, Falklands Govt Representative and Falkland Veterans, and RW Councillor John Hewitt, Lord Mayor of Kingston upon Hull and Admiral of the Humber who were present at the Remembrance Service at Hull Minster on Sunday 29 April 2018. They were later to take the salute on the March-Past. Apologies were received from Maj Gen Julian Thompson who was indisposed due to a back injury. The service which had been mainly organised by Keith Thompson, ex-Purser of the "NORLAND" and SAMA 82 North was extremely well attended; the recently refurbished Minster being full to capacity, and including a large contingent from the 299 Association. There was a short march to the Maritime Museum in Hull where wreaths were laid by the above dignitaries and veterans at the permanent "Norland" Memorial. Three members of the Grimsby Branch PRA are shown paying their respects. Our association continues to thrive and the attendance of 55 members and guest at our AGM/OGM meeting on Friday 5th May clearly indicates that we must be doing most things right. Our chairman, Chris Shillito, gave a special welcome to Adam Garforth, (Garth), one of our veteran Commandos who now lives between Bulgaria and Thailand, half a year in each, "variety is the spice of life" and we are lucky to catch him because unfortunately his visits to the UK are few and far between, this had been a great way to catch up with some old mates. At the July 2016 meeting Craig Gadd, (Gaddy), declared his intentions for a sponsored free fall jump in aid of the BLESMA Charity, (British Limbless Ex Serviceman's Association). The meeting stood up for his challenge and voted to donate £300 from the association funds in support. Many individuals from our association also sponsored him independently, Dave & Pauline Meekin threw in £100, just one example. The free fall weekend was a total success, raising £1800 for the cause. Well done Gaddy, just putting a bit back. Gaddy is currently in Portugal doing yet more sky diving descents. During our recent meeting the Chairman invited Mike Holdsworth & Johnny Philips from the Birmingham Branch of the AEA to give an update on the worrying health issues of Bunny Brown who is currently waiting for his chemotherapy treatment. Our members extend our very best wishes to Bunny and his family. A surprise birthday party, organised by Jamie & Jono was recently held to celebrate Les Ransom's 95th birthday at the Ship Inn, (Dunswell). All those attending had a cracking night. Les extended sincere thanks for the members kindness and doing a fine job in making this a special occasion for him. Les, aged just 21yrs, taken in Italy 1943, just after the Taranto Landings by the 1st Airborne Division at the start of the Italian Campaign on the 9th September 1943. Les served throughout WW2 as a member of the 1st Airborne Division with 250 Company, RASC, 3 Platoon, his unit along with the 2nd Battalion and others, became known as John Frost's men, Maj. John Frost led the assault, these men raced on into Arnhem and captured the North end of that famous bridge in September 1944, and held it for 4 days until their positions were over run, thus spending the rest of the war as a POW, now there's another story..!